There was a news article on BBC News in February this year that Skin may help spot Alzheimer’s and Parkinson’s Disease. 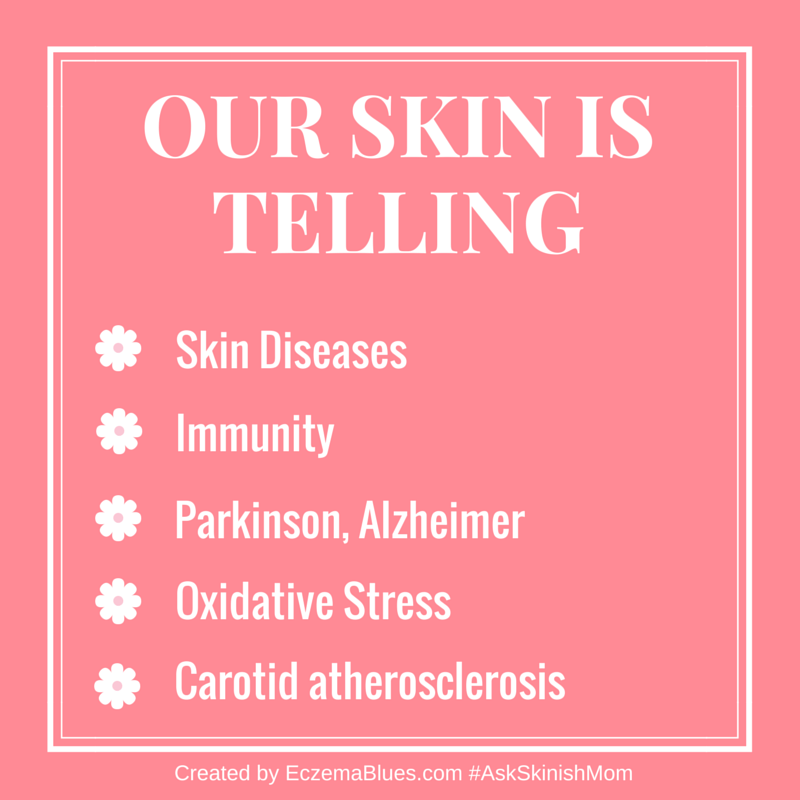 It got #SkinishMom into an investigative mood – What can our Skin actually Tell Us? MarcieMom had interviewed dermatologist Dr Verallo-Rowell in the Skin Health series covering how to watch out for skin cancer via skin changes, but our skin can tell beyond skin issues – it’s amazing that there is the potential for our skin to tell us about our brain and heart! The connection between the skin and brain starts from our body embryo stage. Subsequent to fertilization of the egg by the sperm, the embryo forms into 3 layers (ectoderm, mesoderm and endoderm). The brain, nerves and skin share the sam layer (ectoderm). The brain and skin are always communicating with each other, to the extent our skin is sometimes termed the ‘diffused brain’. For instance, the brain sends stress signals to our skin (more in this interview with Dr Claudia Aguirre). Essential fatty acids (omega-3) is beneficial for both our skin and our brain. Babies’ brain development is affected by the lack of touch and was reported that for Romanian babies who were orphaned (and lacked touch), there was a black hole in their brains. Babies whose cries are attended to showed lower level of brain toxicity (from US pediatrician Dr Sears’ talk). So the brain and our skin are intricately linked, which opens up the possibility that our skin can serve as biomarker to tell us about our brain’s health! Apart from what our skin can tell us about skin disease, our skin can also tell us about our immunity – here’s from Dr Verallo-Rowell where she explained the link between inflammation and our skin. Look for markers of inflammation: your acne flaring up, rosacea attacks becoming frequent, the eczema bigger, wider spread; those with psoriasis too – the lesions are bigger and persistent; boils recurring more often. These may indicate a lowered immunity from such things as too much exercise. Parkinson and Alzheimer – via skin biopsy of skin behind the year to detect presence of an increased in the protein tau and alpha-synuclein. These two protein deposits were found in the brain of sufferers from these two brain disorders. Carotid atherosclerosis – Facial pigmentation may be a useful biomarker for carotid atherosclerosis, which is a degenerative disease of the arteries that result in plaques. Our skin have lipids, proteins, inflammatory mediators, nucleic acids and molecules that serve as a potential to tell us about our health. I wonder if there is the potential of treating our health via our skin too. p.s. just after I tweeted this out, featured guest Dr Claudia Aguirre shared this article she wrote on HuffPost with me, and here’s more reason to reduce stress! Scientific evidence has shown us that stress equates to inflammation, and this can cause havoc on the skin. From acne breakouts, to rosacea flushes to eczema flare-ups, stress is the fuel to the fire of inflammation lurking in these conditions. What’s more, stress not only triggers or exacerbates particular skin diseases, it can also lead to dehydration, lines, blotchiness, hair loss and brittle nailsfor those without an inherent condition. On the flip side, the distress these “stress-related” skin conditions causes is also very real, feeding a vicious cycle. Getting that awful pimple before your date, or the significant hair loss after a traumatic event — these can in turn cause psychological distress, even to the point of creating a psychiatric condition such as depression and anxiety. The statistics are telling: People with the most visible skin conditions (vitiligo, psoriasis) have much higher risk factor for developing anxiety, depressionand even suicidal thoughts. Great information shared here, as always! Some people just don’t believe me when I tell them that my son’s (and my) eczema can be triggered by stress or emotion. Now I have another place to point them too as a reference. Thank you. Thanks Kim for dropping a comment here! Yes, and it’s very very common to see kids with eczema flaring up during exam time in Singapore! I almost here it everytime there’s a parent whose child is in grade six (our major exam here) or secondary school. Cheers and good weekend! Another Aladdin’s Cave of knowledge nuggets! Dermatology is a great speciality for liaison with other the medical specialities, as the skin links with everything, inside and outside the body. Certainly the successful treatment of skin diseases is therapeutic for the mind – very de-stressing indeed, and also important for improved Quality of Life. Biopsychosocial, as some say ;-). Thanks Dr B for dropping by and yes, it’s amazing how ‘clever’ and wired our skin is with our brain and our body!